Non-authoritative restore method is used commonly when a DC failed because of a hardware or software related reasons and this is the default directory services restore mode selection. By default, the Backup tool operates in non-authoritative restore mode, that is when you restore data by using the any of the backup tools(Windows backup,NTBackup, Symantec BackupExec, Veritas etc) you are restoring data non-authoritatively. When the domain controller is brought online after a non-authoritative restore, it detects that the restored data hasn't been updated since the backup was performed, and then it begins receiving and applying updates through normal replication with its replication partners. Therefore, any directory updates that occurred after the backup was created are applied after restore as part of the normal replication process. Replication reconstructs the replication metadata for the updates that originated on the restored domain controller between the time the server was last backed up and the time at which it is restored from backup. Important: Make sure that you have the latest System state and full server backup is available before performing this operation. You can reboot the server in Directory Services Restore Mode using three methods. If you can manually reboot the server press F8 at the time of boot to get the advanced boot option and select directory service restore mode, press ENTER. 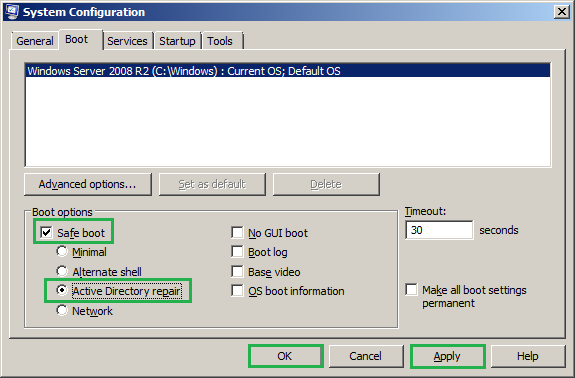 Edit the Boot Configuration Data (BCD). In order to edit the BCD open command prompt and type bcdedit /set safeboot dsrepair and press ENTER. Now restart the server and wait for this to come up. 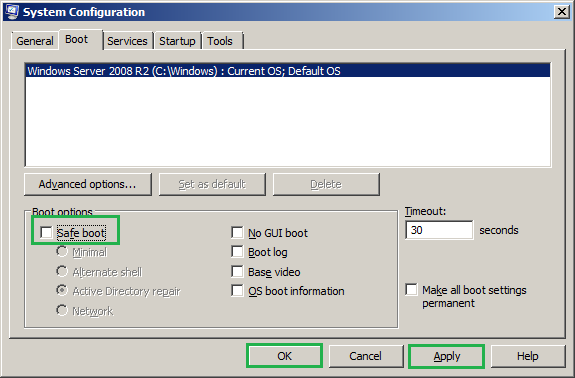 Edit the boot option from System configuration. Type msconfig in run and press ENTER->Under the Boot tab tick the check box safe boot and select Active Directory repair->Appy->OK and on prompt to restart select restart. 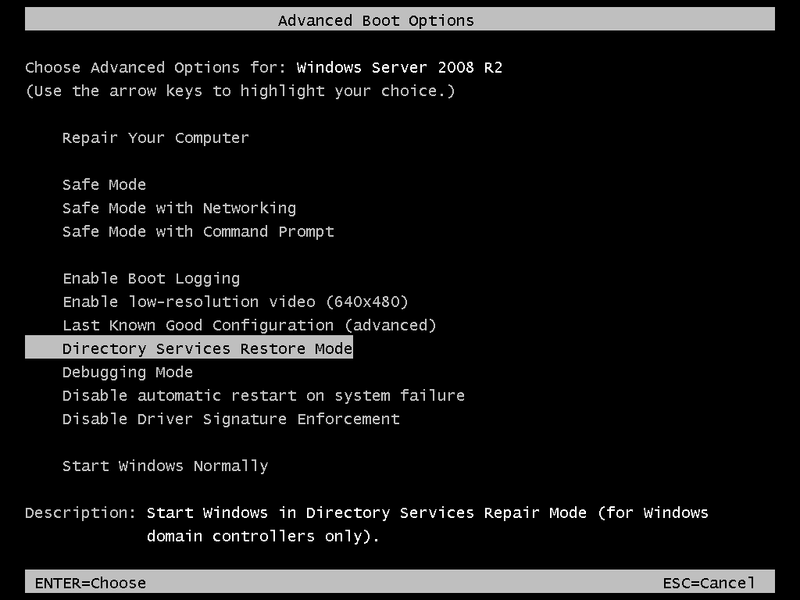 You can select any one of the above option to reboot the server in directory service restore mode. (If the server is in remote location you can prefer to have ii or iii option). 2.Wait a few minutes for the DC to reboot. You can log on locally or remotely, but remember that you will need to supply the DSRM password that you set when promoting the server to a DC. The username for DSRM is Administrator and you may have different DSRM password for different DC. 3.Once you logged on you can use the utility Wbadmin to manage the backup and restore operations. It enables you to back up and restore your operating system, volumes, files, folders, and applications from a command prompt. Each backups that you have created using Windows server backup will have its own unique ID and its generally named based on the date and time that the backup has completed. You will restore the data based on the version of these backups. Consider that I have to recover my secondary DC(second server) and I already have the latest backup of this server on my fist server(shared location: \\server-1\backuP of second server) or you may have the backup on the same server itself. If your backup is in a remote shared file make sure that there is no chances of network failures or copy the backup to local drive and perform the recovery, because the connection issues during this process makes the server become unusable. On command prompt type wbadmin get versions and press ENTER. I have only one backup of the server . From the list, note down the version identifier of the latest backup that you want to restore and for me the version identifier is 04/22/2014-15:40. Wbadmin start systemstaterecovery -version:<backup version that you would like to restore> and press ENTER. So in my case the command will be Wbadmin start systemstaterecovery -version:04/22/2014-15:40 and press ENTER. This will prompt you to confirm if you want to start with restore, type Y and press ENTER. Important: Never try to interrupt the system state recovery until it completes. 5.Wait for this process to complete. You will see the status on the same command prompt window itself. Type YES and press ENTER to reboot the server when it prompts. 6.If you were initiated the server to reboot into directory service restore mode(DSRM) as per the steps 1ii and 1iii the server will again boot into DSRM mode. In order to boot the server as normal, after initial reboot login with DSRM user name and password. You will have the below prompt now, press ENTER to close the window. Now change the boot option of your server to normal. If your option was as per the steps mentioned in 1ii. Open a command prompt and type bcdedit /deletevalue safeboot and press ENTER. You will have a success message as below and you can reboot the server once again. Now it will boot the server in normal mode. If your option was as per the steps mentioned in 1iii. Type msconfig in run and press ENTER->Under the Boot tab tick the uncheck box safe boot ->Appy->OK and on prompt to restart select restart. Now that’s it the non-authoritative restore is completed.